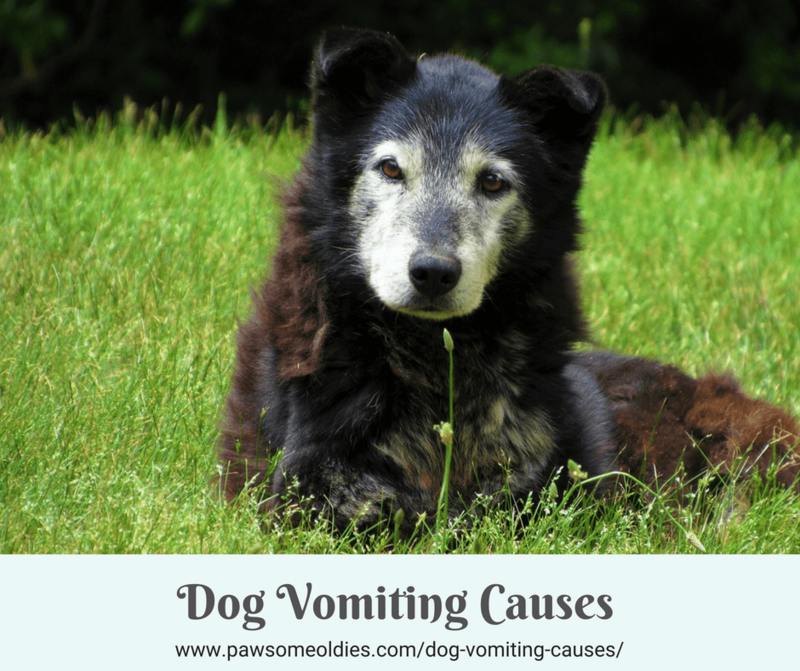 Dog Vomiting Causes - What Makes an Old Dog Vomit and When to See a Vet? 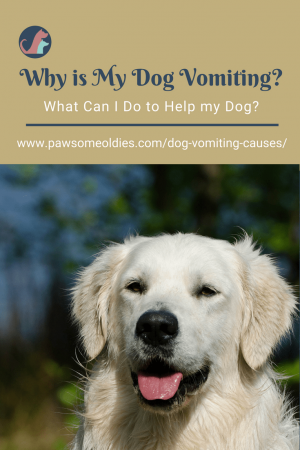 This post looks at some common dog vomiting causes, as well as some remedies that you can use to help your oldie feel and get better! You know the signs – your dog’s ears are pinned back, her tail’s down, her chest’s heaving, she keeps licking her lips, and she’s coming to you for help. Before you can do anything, she throws up on your freshly cleaned rug! Vomiting in dogs is extremely common. Vomiting is one way to reject things that are harmful or not agreeable to the body. It can be a good thing! Heck, sometimes dogs intentionally eat grass to induce vomiting when they are not feeling one hundred percent. There are a zillion possible causes of vomiting in dogs. Knowing some common causes may help us decide whether a visit to the vet is warranted, or whether we can just adopt a wait-and-see attitude. Is your dog a scavenger? Does she like ransacking the garbage bin? A very common cause of dog vomiting is dietary indiscretion – the dog has eaten something that is rotten and teeming with bacteria. Eating something spoiled is of course disastrous for the stomach, and can result in a condition called gastritis, which is inflammation of the stomach lining. If the dog has eaten something spoiled, normally the vomiting will last only for one or two days. Not much harm done. Just let Nature take its course but make sure that the dog is hydrated. To prevent this type of vomiting, be sure to keep the garbage lid on tight! It also helps to not let your dog off leash while on walks, especially long walks, to avoid the dog from roaming and eating something while you are not paying attention. Yes – you got that right! Some dogs are notorious junk eaters (not that I’m implying your socks are junk…). They eat everything and anything, including socks, underwear, rocks, small toys… The list goes on. If your pawsome old dog is one of such dogs, be aware! Ingesting something indigestible could be one cause of vomiting in dogs, especially when the dog is vomiting on an empty stomach. If your dog continues to vomit on and off even on an empty stomach, be sure to take him to the vet for a checkup. If you suspect your dog has eaten something indigestible (maybe you are missing a sock), your vet will probably take an x-ray of your dog’s stomach. Sometimes the x-ray will reveal the object, but sometimes it may not, in which case an endoscope has to be used. If your dog enjoys sampling different items (be it foods or otherwise), there is also a big chance for him to accidentally ingest something poisonous. If you suspect your dog has eaten something poisonous, take him to an emergency veterinary clinic or call your local poison control center immediately. The fix is very simple. Feed your dog later in the evening, or divide the evening meal into 2 smaller meals. Feed some at regular meal time in the evening, and the rest just before going to bed. If your dog has been eating the same food day in and day out for years on ends, there is a good chance that he will become allergic to the food. Sorry to say, but the fact that your dog has not had any problem up until now doesn’t mean that he won’t ever develop food allergies down the road. Fact is, food allergy could happen to any dog at any time. Not sure if your dog has food allergies, or don’t know exactly which food item(s) he is allergic to? Check out this post for more information. If your old dog has been put on certain medications (e.g. antibiotics, NSAIDs, chemotherapy), and has started vomiting, chances are the vomiting is one of the side effects caused by the medication. If the vomiting is severe, tell your vet about this side effect and ask if he could perhaps change the medication or dosage. Sometimes, dogs who have stress and anxiety, or those who are nervous or overly-excited may vomit (and have diarrhea) as well. Understandably, oldies are more susceptible to stress and nervousness due to a number of reasons (e.g. can’t hear or see too well, aches and pains, etc). If your old dog is stressed, try using the herb chamomile. This herb has calming effects and is very gentle. One easy way is to use a glycerine-based tincture of the herb (see below). Sometimes, vomiting in dogs may be a symptom of some underlying health issues. Pancreatitits: This is a disease that involves the pancreas. It refers to an inflammation of the pancreas, which can cause such as symptoms as vomiting, tummy aches, and appetite loss. Pancreatitis can be acute or chronic. Certain dog breeds (e.g. schnauzers) are susceptible to pancreatitis. Also, dogs who eat a lot of fatty foods are prone to this health problem. Stomach Ulcers: Dogs with stomach ulcers also tend to vomit, sometimes with blood. Stomach ulcers in dogs are often caused by NSAIDs. Liver Disease: Liver disease could cause a dog to have tummy issues, such as vomiting, bloating, and diarrhea. The dog will likely throw up bile. Kidney Failure: Kidney failure in dogs could also cause vomiting. Kidney failure can be acute or chronic. Older dogs are more prone to chronic kidney failure, so if you have an oldie, be sure to visit my post on dog kidney failure to find out more about this disease. Inflammatory Bowel Disease: IBD involves inflammation of the mucous lining of the GI tract. It could be caused by food allergies, anxiety, overuse of antibiotics, but sometimes the cause is unknown. Depending on which part of the digestive system is involved, the symptoms are different. When the stomach and small intestine are involved, it causes vomiting. If the large intestine is involved, it causes diarrhea and tummy aches. 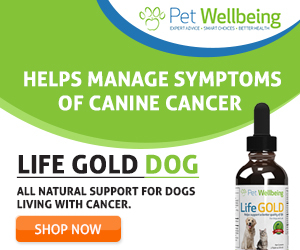 Canine Cancer: Yes – the Big C – some types of canine cancer can also cause chronic vomiting in dogs. For example, mast cell tumors, stomach cancer, liver cancer. The above health problems are rather common among old dogs. So if your oldie is suffering from chronic vomiting, it is important that you take your dog to the vet for a thorough health checkup to find out the underlying cause. So when should you take your vomiting dog to the vet? is having acute non-stoppable vomiting. is vomiting AND has diarrhea. has been vomiting on and off for over a week. has a fever of over 104°F. has (or you suspect he has) ingested something undigestible or poisonous. If your oldie is prone to the occasional vomiting, it’s good to have something on hand to help ease the discomfort (and lessen the mess). If your dog vomits because of stress and anxiety, try using this flower essence formula that works on the emotional aspect associated with nervous vomiting. It’s simple to use – just put a few drops in the dog’s drinking water and that’s it! As mentioned above, chamomile tincture is also a good remedy to calm an anxious or stressed dog. 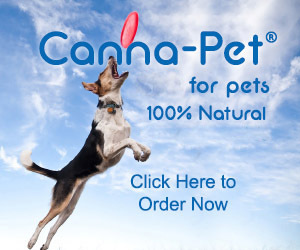 You can put a few drops of the tincture in the dog’s drinking water. If your dog’s vomiting is largely due to issues of the digestive tract (e.g. gastritis, IBD, etc. ), you definitely want to have this handy remedy in the first-aid kit. It contains friendly bacteria (probiotics), enzymes, and vitamin B complex to help re-balance the gut flora and to help detoxify the GI tract. As you can see, there are quite a few possible dog vomiting causes, some of which could be serious and even life-threatening. The bottom line is, when in doubt, and if the vomiting is severe, get your dog to the vet especially if you have an older dog.